Microscopic examination of direct ocular specimens may provide valuable information but depend on the quality of the sample. Smears are generally obtained from the conjunctiva, cornea, aqueous, vitreous, and punctum. There are many types of stains used to examine direct specimens. The gram and giemsa stains are used in our laboratory. 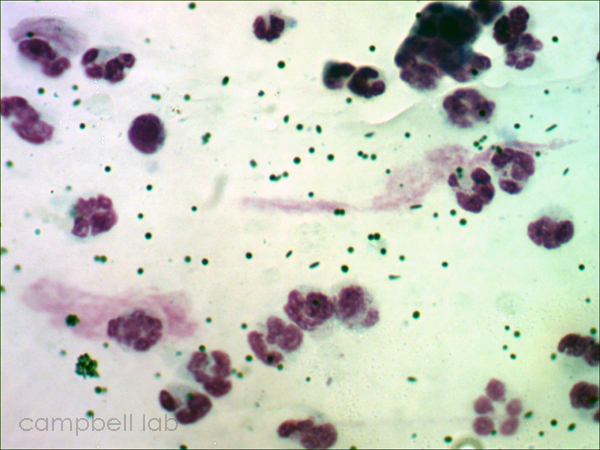 Gram stain is used to examine for bacteria, and the giemsa stain is used to determine cytology. 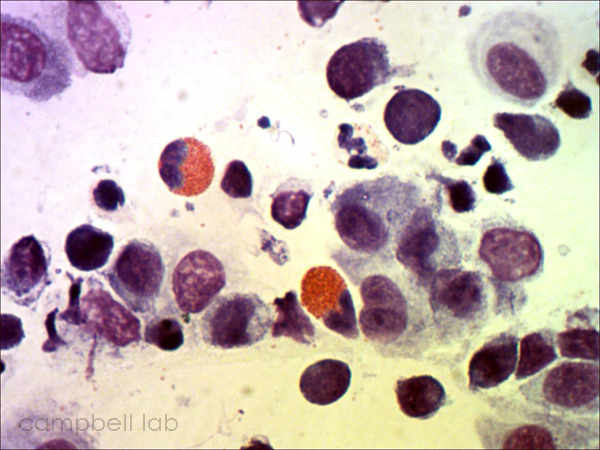 The giemsa stain is also excellent for detecting bacteria, fungus, Chlamydia, and Acanthamoebae. Many laboratories are uncomfortable with the giemsa stain because of limited experience. Laboratories may provide the same answers with other staining techniques. Direct examination of conjunctival specimens can be valuable in diagnosing bacterial, viral, and chlamydia conjunctivitis. The presence of eosinophils can indicate allergy and abnormal epithelial cells from the tarsal conjunctiva can suggest the possibility of masquerade syndrome. Conjunctival specimens should NEVER be obtained with a soft-tipped applicator. Experience has determined that such collection results in poor specimens that are not diagnostic. Conjunctival smears are obtained by anesthetizing the conjunctiva with topical 0.5% proparacaine hydrochloride for about 5 minutes. Using a spatula, the bottom eyelid is lowered, the bulbar conjunctiva is firmly scraped for cells, and the specimen is placed on a glass microscope slide. In a similar manner, specimens can be obtained from the upper tarsal conjunctiva by inverting the upper eyelid. The smears should be obtained in duplicate in case of accidents and confirming results on two slides. The slides are air-dried, fixed, stained, and examined. Conjunctival specimens awaiting transport to the laboratory are quite stable at room temperature. This technique is not an invasive biopsy. Superficial smears contain epithelial cells, inflammatory cells, and micro-organisms. Bloody specimens are not necessary. The staining of corneal specimens is a valuable diagnostic tool that can guide crucial keratitis therapy whether to pinpoint or rule out infection. The presence of bacteria, fungus, and Acanthamoebae can commence earlier therapy. An adequate corneal specimen is a function of the experience of the presiding ophthalmologist. ONLY TRAINED OPHTHALMOLOGISTS SHOULD OBTAIN CORNEAL SPECIMENS. Corneal specimens should be taken with a spatula, surgical blade, or jeweler's forceps using a slit lamp for magnification. When, what, and where to culture are judgement calls. 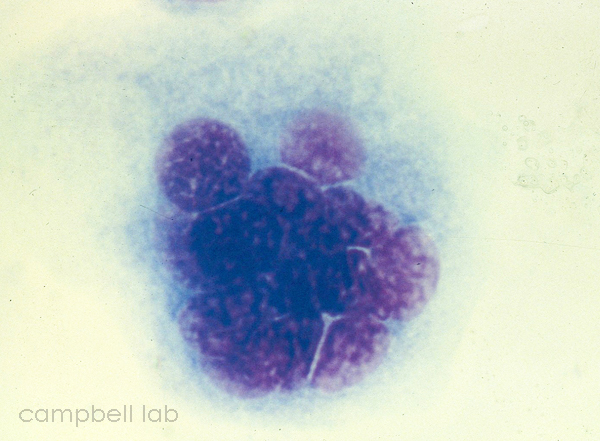 In small infected areas where the specimen may be sparse, an adequate culture is probably more important than a smear. The complications of perforation and denuding an intact epithelium may endanger a favorable prognosis. The staining of aqueous and/or vitreous specimens is also diagnostic in detecting the appearance of bacteria, fungi, and the inflammatory response. ONLY TRAINED OPHTHALMOLOGISTS SHOULD OBTAIN INTRAOCULAR SPECIMENS. Aqueous and vitreous specimens should be placed directly on the slides from the tapping syringe and needle. 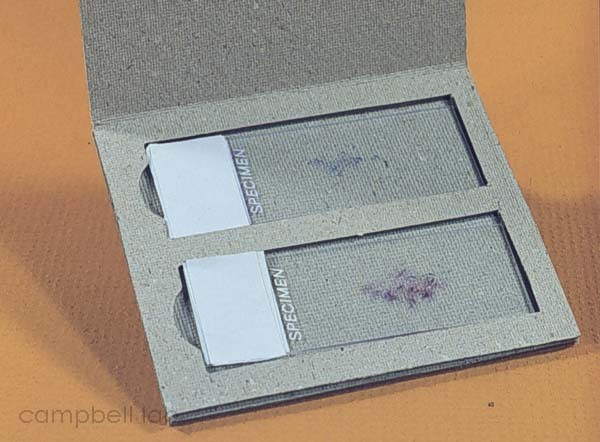 The sample SHOULD NOT be smeared over the entire slide like a blood smear. This makes examining the slide more difficult. Slides are air-dried, fixed, stained, and examined. Intraocular specimens awaiting transport to the laboratory are quite stable at room temperature.